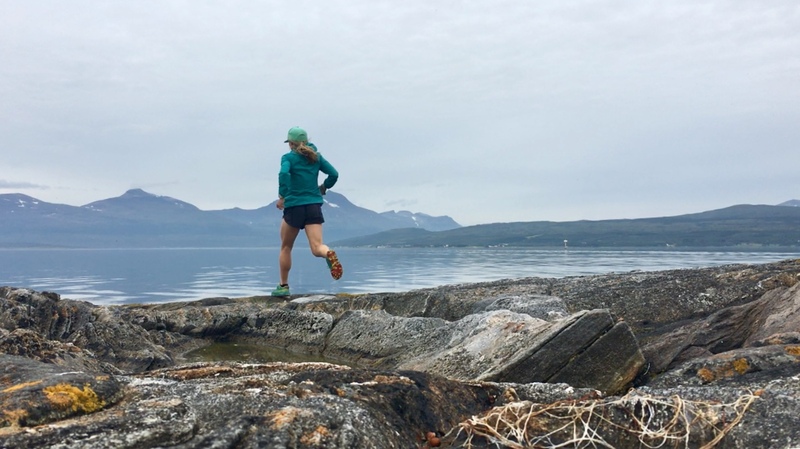 After nearly 11 months since my last Skyrunning race—the Rut 50km in Montana, USA, and about 15 months since my last international Skyrunning race—Transvulcania 75km in Canary Islands—I tried my hand at Tromsø Skyrace Hamperokken 60km in Norway. Hamperokken was the most technically challenging race I’ve ever done and the steepest with 15,750’ gain in 37miles. So it wasn’t exactly a cruiser warm up race. It was more like falling off a boulder into an icy cold glacier fed lake. Don’t run the course a few days before running the course. Maybe a nice scout of the finish and the start are good for the nerves but even if you’re scared of the course, try to avoid a 4h excursion on the toughest part of the course in the days before the race. In the past I’ve had smart coaches who encourage their runners to rest, stay off the feet and remember that the work is done. Don’t get sick. This seems like one you have no control over. But a nice bout of food poisoning or other sickness that leaves you unable to eat in the couple days before the race is probably going to leave you a little glycogen depleted. Try to avoid restaurants and eat familiar, basic foods and bottled water if you’re traveling. No matter where you go in Europe the food is pretty similar and predictable at grocery stores so planning to stay at a hotel with a kitchenette is a good idea. And remember hand sanitizer and vitamins. Generally, you’re ability to store glycogen is ramped up by all your training so just eating simple carbohydrate rich foods without a lot of fiber in the last 48h before a race is enough prep for a full gas tank come race day. Don’t be a tourist. It’s hard to travel half way across the world and not plan to see some sights. But again, keeping focus on recovery prior to the race and staying off the feet is a good way to save the legs for fresh running. Don’t stress. Having to work the week of an international race is sometimes as unavoidable as late flights and lost luggage. But stress is as much a mindset as a complex of circumstances. Focusing on the breath or counting inhalations is one way to wind down the sympathetic nervous system that wants desperately to fix all your problems with megadoses of excitatory hormones. Sometimes breathing exercises or a sequence of stretches can calm the senses. Don’t skimp on sleep. Running half way across the world also means you’re running in a completely different circadian rhythm. Europe is running 8 hours later that we are in mountain standard time. Your body can take weeks to adjust to a new sleep cycle, but there are some ways to help it along. Being diligent about getting on your new time zone as soon as you’re in travel status is one. Bring an eye mask, ear plugs and something to help you sleep like melatonin to assist the new schedule. Research shows that exposure of any part of the body to light during the night will disrupt your ability to enter into deep sleep. You can close shades and stay out of the sun during night hours of your destination city during travel to help. And as we all know, screen time stimulates the brain, and has an excitatory and even addictive influence on our nervous system. So begin by unplugging during hours you would be sleeping at your race destination. Everything rarely goes perfectly during races, let alone international ones. But some small tweaks to the race week prep can go a long way toward getting you safely to the finish line, no matter how crazy the race course.